People gather as they wait for the arrival of South Sudan's President Salva Kiir in the capital Juba on Aug. 6, 2018, following the signing in neighboring Sudan of a cease-fire and power-sharing agreement. Thousands of people, including women, traditional chiefs and youth, gathered Monday at Juba International Airport to welcome South Sudan President Salva Kiir back from Khartoum after a power-sharing deal was signed with rebel and opposition groups. 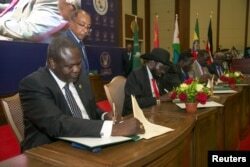 On Sunday, Kiir, rebel leader Riek Machar and representatives of other opposition groups signed a deal in Sudan in the presence of Sudanese President Omar al-Bashir, Ugandan President Yoweri Museveni, Kenyan President Uhuru Kenyatta and Djibouti President Ismail Oma Ghuelleh. The deal will see Machar return as the first of five vice presidents under a transitional government of national unity. South Sudanese rebel leader Riek Machar, left, and South Sudan's President Salva Kiir sign a ceasefire and power sharing agreement in Khartoum, Sudan, Aug. 5, 2018. At the airport Monday, many people carried banners praising Kiir, describing him as "a hero of peace," while others proudly waved the South Sudan flag. The Jurchol community and other groups performed traditional dances at the airport. While many citizens celebrated, some Juba residents such as Deng Bol stressed the need for their leaders to implement the agreement effectively. "Now that everyone is given a position, they should use those positions to serve the people of South Sudan, and it will be the people of South Sudan who will judge who is a good servant of the people. The other thing that we want is to make sure there is unity and common purpose among the leaders of South Sudan. If they don't do that, they will have a problem with the citizens, because we have seen how people have suffered," Bol said. On Sunday, news of the signing sparked spontaneous celebrations across the country, with many Juba residents dashing into the streets where they ululated and chanted peace slogans. Motorists honked their horns as they drove through the capital with traditional and pop music blaring from their cars. Juba resident Clement Kau said he hopes the agreement leads to a better way of life for most South Sudanese. "We South Sudanese, we need peace to come here so that things can change, in terms of development, road construction and even food security. I am one of the people who is very happy to join this celebration today," Kau told the VOA radio program South Sudan in Focus. Juba resident Joseph Ochalle agreed. "When there was peace last time, people were stable, and the situation was fine, there was no economic crisis. But when the war broke out in 2013, everything falls apart," he said. Residents like Deng Achol fear that government and rebel forces will clash again once they return to South Sudan. "If they are outside, they are friends. If they are here in South Sudan, they become enemies. I want to tell them that citizens are tired of you, and this is the last hope for you guys. If you come and fail this peace, then all citizens will rise [up] and call for the international community to come and rescue us," he said. Juba resident Suzy Anthony thinks everybody, including South Sudan's political leaders, are weary of war. "In 2016, we didn't get a lot of suffering like the one we have now in 2018. We have learned that tribalism cannot take us forward. We have learned that corruption cannot take us forward. We have also learned that the war has made all of us poor," Anthony told VOA. The warring parties have agreed to continue discussing details on security arrangements and implementation modalities in Khartoum before signing a final peace agreement.